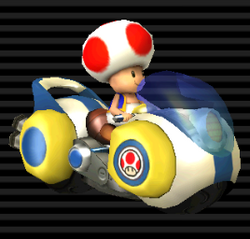 The Jet Bubble (known as the Bubble Bike in Europe and Oceania) is a small-sized bike in Mario Kart Wii. It can be unlocked by winning the Mirror Leaf Cup. The bike is shaped like a bubble, hence its name. The Jet Bubble has no kart counterpart for its size class, but its stats are similar to that of the Standard Kart S.
The Jet Bubble is a fairly balanced bike; its two best stats are its speed and drift. Its weight is fairly low (tied with the Booster Seat), although it's the heaviest small bike in the game. Its other stats are average. It is the fastest bike without a kart counterpart. The Jet Bubble features the same speed, handling, and mini-turbo stats as the Dolphin Dasher. Baby Mario - White body, red stripes and rings, yellow bulbs, blue windshield. Baby Luigi - White body, dark green stripes and rings, light green bulbs, green windshield. Baby Peach - White body, hot pink stripes and rings, pink bulbs and windshield. Baby Daisy - Slightly yellow body, orange stripes and rings, bright orange bulbs, teal windshield. Toad - White body, blue stripes and rings, yellow bulbs, blue windshield. Toadette - White body, magenta stripes and rings, pink bulbs, magenta windshield. Koopa Troopa - Yellow body, lime stripes and rings, dark green bulbs, blue windshield. Dry Bones - Black body, bronze stripes and rings, brown bulbs, blue windshield. Male Mii - White body, blue stripes and rings, light blue bulbs, blue windshield. Female Mii - Pink body, white stripes and rings, white bulbs, blue windshield. "The Babies may find this balanced ride to be just the buggy they're looking for. The Jet Bubble may not blow the doors off the competition, but it won't leave you eating the dust either. And, it's a cool-lookin' Bike!" This page was last edited on February 4, 2019, at 22:11.